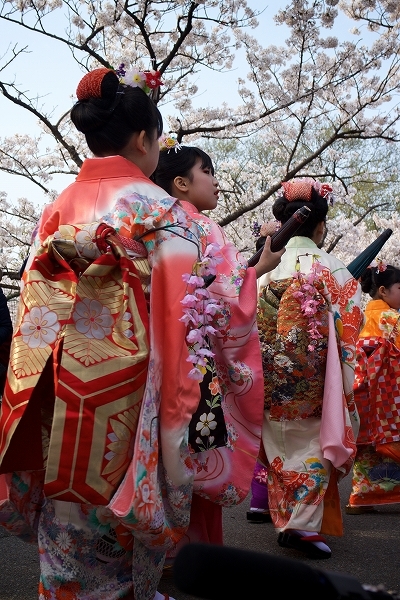 If you want to take photographs of Japanese cute girls and women with colorful Kimono under exotic Sakura, I recommend you to go in Oiran rally festival in Sado island. 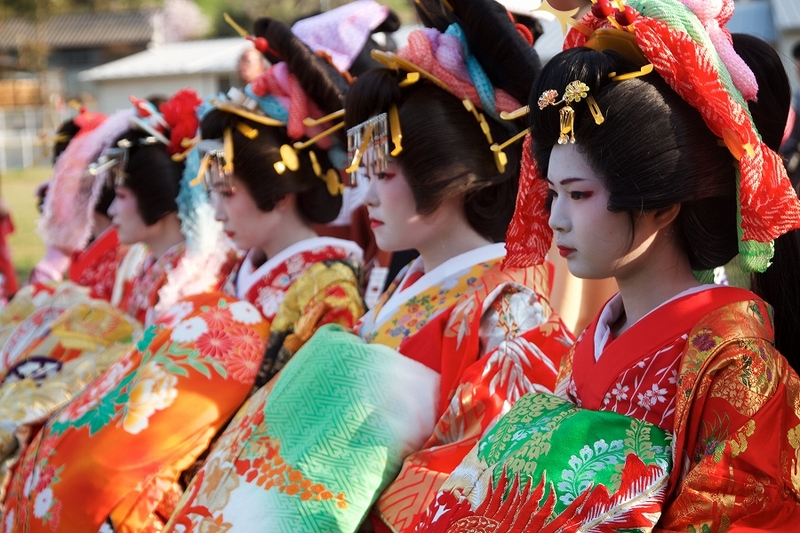 Oirans were courtesans and entertainers to ancient Japanese rich men and elites, however, educated high-class artists. The splendid movement and royal dress up of Oirans gave me the impression first, they may be ‘queen’ and members of king family. Oirans’ gorgeous performance with long-line was fantastic. 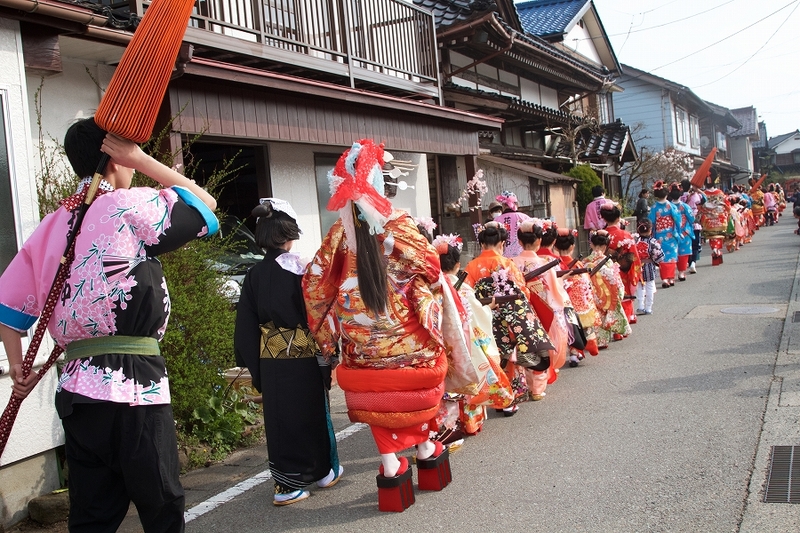 If you participate in the event, you will get experience to see Oiran and different art-form of Japanese traditional dress. 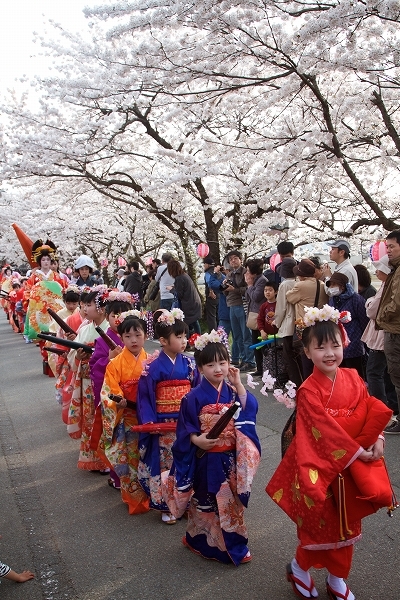 This year, the festival held in full cherry blossom spring season on 16 April 2017 this year. The rally was started at 3.00 from “Hamochi Kaizen Center” to around which enjoyed by the huge audience. The beautiful cherry blossom, artistic-cultural performance, and soft sunlight nature will give you the sacred feeling and enormous joy. 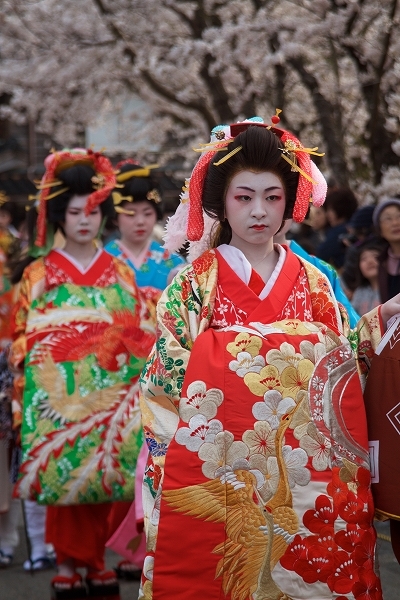 The pretty and stylish oiran rally in the color-contrast between mild-pink sakura and deep bold Kimono will excite your sight and sense truly. On the eve of the rally, in the day whole Hamochi delighted with festivities spirit. The rally was led by 3 Oirans with the group of follower and children. 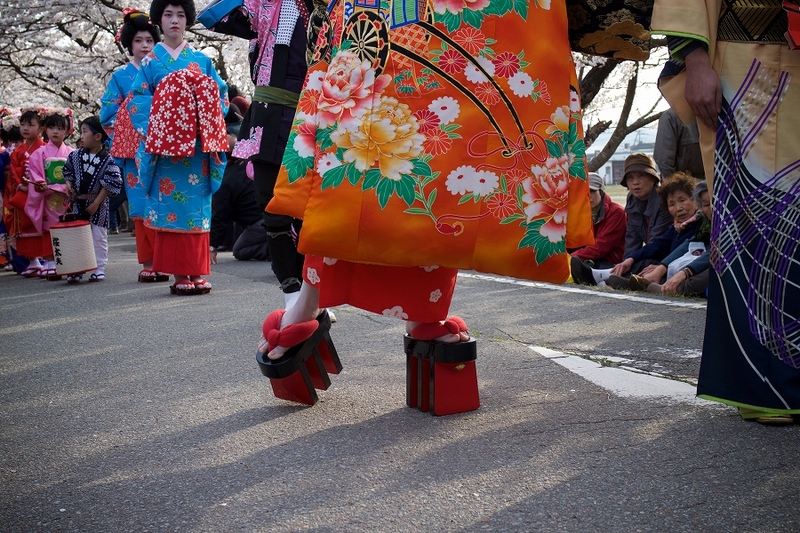 From the participants, I learned about ‘Soto Hachimonji’, the special steps of Oiran, which expressed the sexual appeal. The rally was moving ahead with the theme music, however, was stopped on the way with a certain interval for taking rest, however, showing them to the audience. In the end of the rally, an open air photo session held in front to Sakura tree. As a remembrance, you will be able to take the photo with Oirans as well with free of cost. In a nutshell, the antique style will, of course, wake up your gorgeous feeling if you go the festival. I love Oirans rally. Last year also I went to the festival. The unique, gentle and artistic performance of Oirans surely will make you happy. 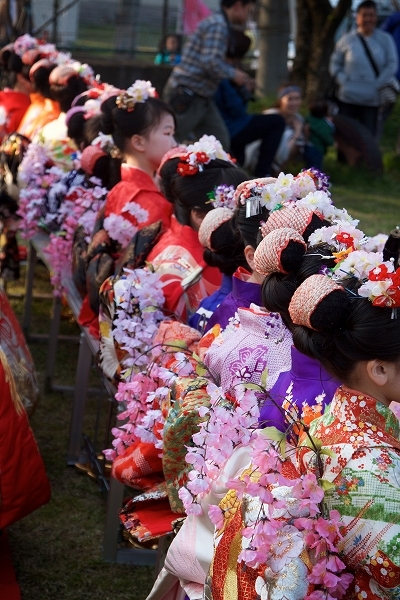 In every spring Hamochi community arranges the exotic oiran rally. 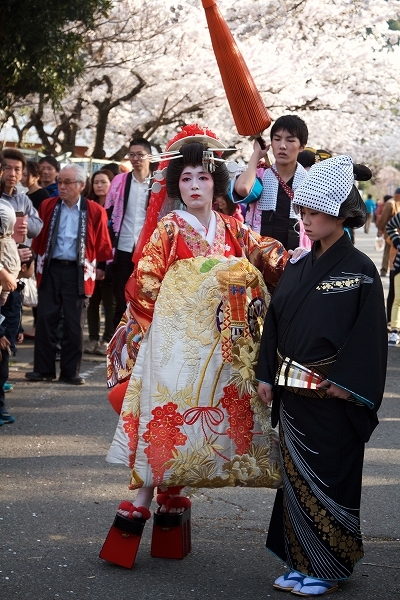 Anyone can be a oiran performer if can stay 3-4 months in Sado for rehearsal and mode adaptation. 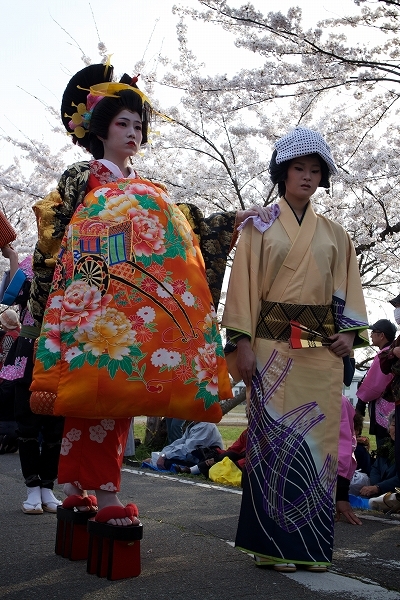 Beyond the prejudice, loving and respect of art and tradition of Japanese people appreciable. I have the vision to join in the event in next year rally also. Hope you will go in Sado and will take a photo with Oirans. 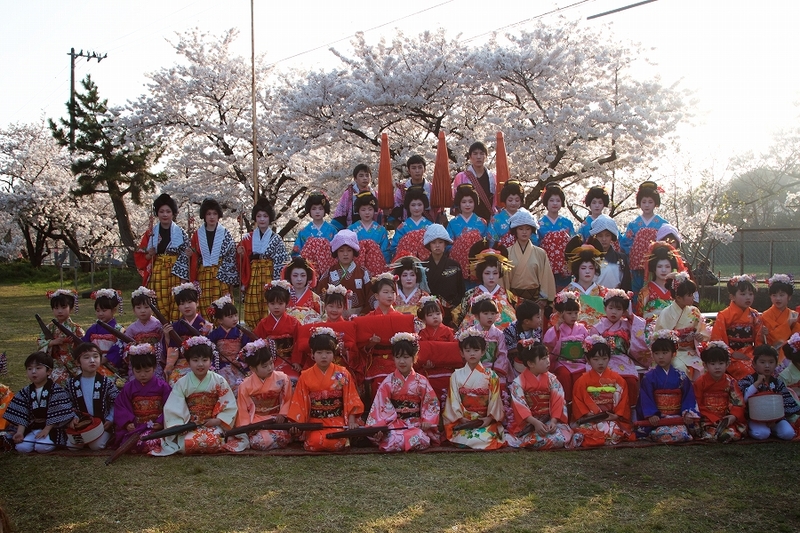 I am sure, you will get nice cultural experiences during spring with Oirans and Sakura in the beautiful Sado Island.